« Where’s my WIPs at? perfect button! Picks up the tan flecks in the wool. 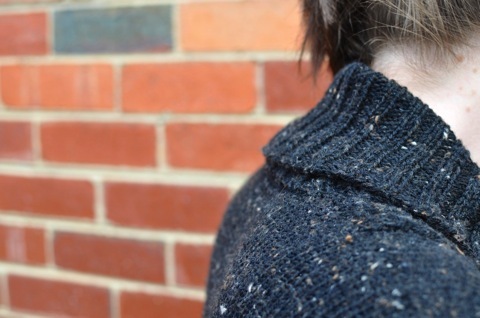 The finished jumper is lovely, despite the things you mention you’d modified. I’ve got some of that same wool in the same colour even, waiting to be knit up. 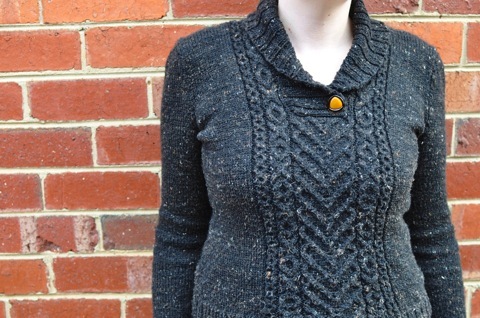 Thanks for sharing your project, gives me a good idea of how it knits up! I second your comments regarding neck lines needing to be cast off prior to stitches being picked up, it really makes a lot of difference to the “strength” or stability of the neck line. Also the same goes for the shoulders. Anything with sleeves in I would sew together or 3 needle bind off, a vest I might graft depending upon the ply. 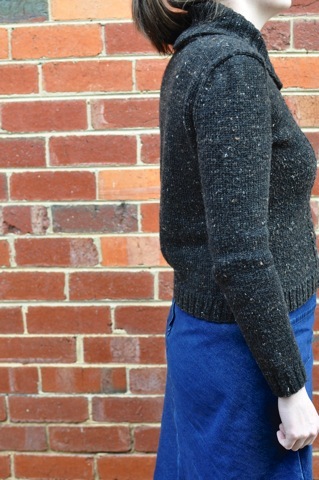 It looks like a really good jumper and in this crazy Melbourne weather we’ve been having I’m sure it has come in handy! Another great knit that looks fabulous on you. What a shame the pattern wasn’t as detailed or up-to-date with techniques as it could have been.